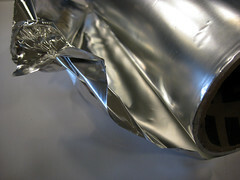 Aluminum foil used with fusible interfacing is a great inexpensive and super available substitute for conductive fabrics. !!! 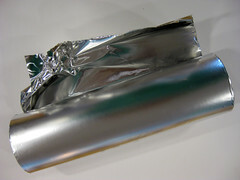 CAUTION: Unlike with conductive fabric you can NOT simply overlap two pieces of aluminum foil, fusing one on top of the other to make an electrical connection. The fusible interfacing acts as an isolating barrier. In the case of conductive fabric, the porosity of the fabric allows it to partially absorb the fusible interfacing so that this technique makes for a relatively stable electrical connection. I am looking for a thin fabric like material that I can be heated by a low voltage battery. I am really only looking to get it to approx. 100 degrees F. I was told that Gorix sales a similar product? I am not able to reach them via email though. I really need a sample product. The size I need is approx. 1 inch in width by 2 feet in length. It is just a long thin piece. Also I would like to get to it come with wire leads to run into the battery as I not that handy. Any help you can provide would be much appreciated. Do you know if this can be used instead of Conductive fabric in the bend sensors you have posted instructions on? I think it should work given you don’t mistreat it too much at the ends… the fabric just seems to be there to give a solid connection to the staple. yes, you can make a bend sensor with alu foil instead of conductive thread or fabric. 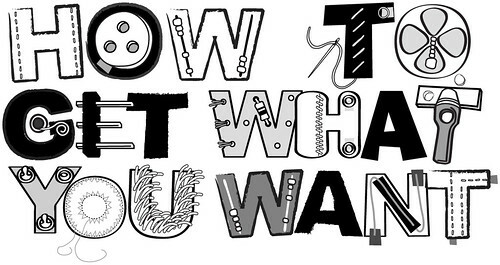 it really depends on your application and what sort of flexibility you need. I am looking for a substitute for conductive fabric for my iPad as a pen. Please give me a solution as soon as possible. i need to design a coat for monitoring physiological parameters( like ecg ,temperature…) of a baby. so i need conductive fabric materials which can conduct bio-potentials to electrode..please suggest some fabrics that’ll best suite the baby…..
i am looking for a fabric weave which is suitable for the conductive coating in cotton ,polyester,and p/c blend,and their calculation,please suggest me as early as possible.